Our agitators have a flexible, modular design and enable you to tailor a mixing solution to your exact requirements. The agitator range includes top-mounted units, with or without bottom support, as well as bottom or side-mounted units. Modularity lend itself to ease of installation and maintenance, and superior design ensures quality, performance and economy. The purpose-built agitators have smooth surfaces that promote optimal flow and specially developed impellers that support both maximum flow rate and gentle product treatment. Alfa Laval Bottom mounted agitator. Low energy consuption and gentle product handling design. Alfa Laval Side mounted agitator. Low energy consuption and gentle product handling design. Alfa Laval Top mounted agitator. Low energy consuption and gentle product handling design. Alfa Laval Top mounted agitator with base support. Low energy consuption and gentle product handling design. 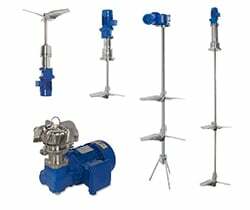 Alfa Laval magnetic mixers offer effective mixing for applications with high demands on hygienic and aseptic design.